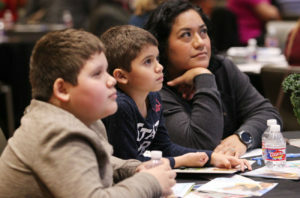 EDINBURG — Inviting smells of Italian cuisine pervaded the Edinburg Conference Center at Renaissance hall Thursday evening. Cheesy beef-eggplant rolls were the main course of the night, with lemon-blueberry salad and toasted sesame orzo as side dishes and chocolate cake for desert — all of which were nutrient-packed, low-cost recipes that guests at the Dinner Tonight Healthy Cooking School Diabetes Edition demonstration learned to prepare. This was the fifth time Texas A&M AgriLife Extension has hosted such a demonstration in Hidalgo County, but its first time partnering with the Doctors Hospital at Renaissance Health Wellness Institute. Andrea Valdez, an extension agent for Texas A&M, said that their partnership is ideal because they share the same vision: a healthier Rio Grande Valley. “The goal tonight is to teach nutrition techniques and healthy recipes, and have people feel comfortable with going home and making those dishes for their family,” Valdez said. “It is about making healthy choices and having the healthy alternatives. Valdez was one of four cooking instructors at the event. 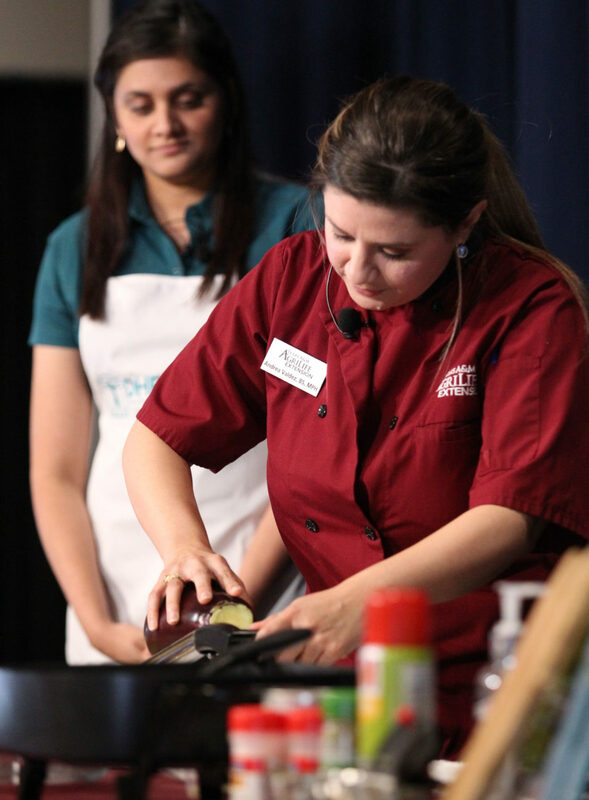 She demonstrated how to prepare cheesy beef-eggplant rolls and a lemon-blueberry salad with DHR Health Wellness Medical Director Dimple Desai. Both stood onstage before a table with laid-out, pre-measured ingredients and an array of cooking ware. Cameras were used to project close-up views of their steps onto two huge screens in the room. This was also the first time the cooking school presented a diabetes edition. All recipes used at the event were crafted by university health specialists specifically for diabetics, focusing on low carb and low sodium. Desai said that though some cases are not preventable, it is possible to manage it, and the time to start doing so is now. In South Texas, the number of adults facing diabetes is more than 20 percent higher than the rest of the state, according to the South Texas Diabetes Initiative. And, according to A&M Healthy Texas, 20 percent of South Texas residents have been diagnosed with the chronic disease, and 73 percent are at risk of developing it. In the Valley, nearly one in three people are diabetic. Ramon Treviño and Diana Huallpa are a newlywed couple who learned of the event on LinkedIn while searching for ways to change their diet. Both were told by their doctor a few months ago that they were approaching stage one of obesity, so they wanted to take action. Treviño said that his goal by the end of the year is to weigh 185 pounds, around 40 pounds less than what he currently weighs. Huallpa said that changing habits is always arduous, but starting the journey of healthier living alongside her husband makes the venture easier. She said that her weakness is her sweet tooth for chocolate — luckily, chocolate cake was on the menu for the night. 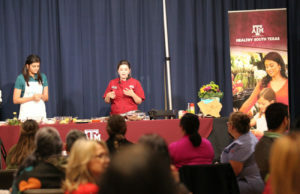 Clarissa Garcia, who is a registered dietitian at the DHR Health Wellness Institute, was an instructor for the dessert lesson and said that eating healthier does not mean cutting out favorite foods. “It is about balance and carbohydrate counting, which is something we advocate for very strongly,” said Garcia, who recommends 15 grams of carbohydrates per serving. “As long as they have that balance, they can incorporate the foods that they like. We want to put to rest some thoughts that they can’t have tortillas, that they can’t have cake.